Welcome to the 9's, the last of the "Meanies". At this point your student is becoming a Multi-Facts pro. Well, don't let them stop now! They're poised to conquer those pesky "Meanies" and are almost ready to face the "Masters"! 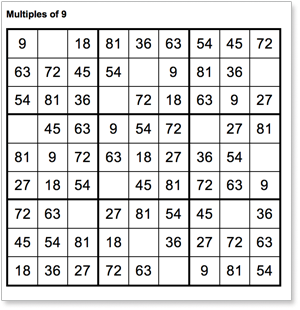 If your child is struggling with the multiplication table, they're not alone. Many kids face this same dilemma every day. Traditional methods like flashcards and boring worksheets just don't work for everyone! Mastering multiplication facts takes time, effort and care, which is why Multi-Facts puzzles are so successful. They provide a fun, engaging, and challenging alternative.